The Hastings Jack-in-the-Green festival was revived by local group Mad Jacks Morris Dancers in 1983 and is now one of the biggest annual gatherings of Morris Dancers in the country. The Jack is “released” every year and is central to the festival. The main procession of the Jack takes place on the May Bank Holiday Monday through the streets of Hastings Old Town, starting from the Fisherman's Museum. 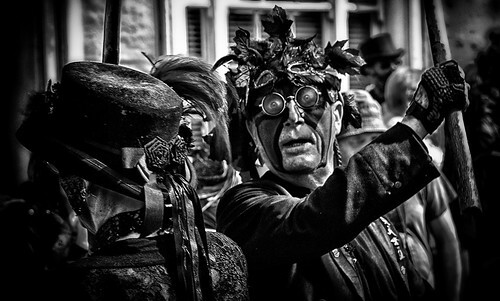 The Jack is accompanied by Mad Jacks Morris, the Green Bogies, dancers, giants, musicians and various others. The procession ends on the West Hill where Jack is "slain" to "release the spirit of summer"
A Jack in the Green (also Jack in the green, Jack-in-the-green, Jack i' the Green, Jack o' the Green, etc.) is a participant in traditional English May Day parades and other May celebrations, who wears a large, foliage-covered, garland-like framework, usually pyramidal or conical in shape, which covers his body from head to foot. The name is also applied to the garland itself. May 1st has long been an important part of the annual Calendar. It is the start of summer in these latitudes and as such has always been a day for celebration: the Celts celebrated May Day as Beltane; The Romans dedicated the day to the Goddess Flora and would go to the woods to cut a tree and decorate it with ribbons and flowers, this is the origin of the May Pole. In the 16th and 17th centuries in England people would make garlands of flowers and leaves for the May Day celebration, they became increasingly elaborate. Works Guilds would try to outdo each other, in the late 18th century this became a matter for competition, milkmaids in London carried garlands on their heads with silver objects on them, but the crown had to go to the chimney sweeps. Their garland was so big it covered the entire man. It became known as Jack in the Green. In Hastings there were at least two groups who paraded a Jack in the Green until about 1889. By the turn of the century the custom was seen no more. The reasons were twofold: the Act which stopped boys climbing chimneys had been passed and these had been the main performers; secondly the Victorians had a different attitude to such customs, the prettification of customs took place, no more the giant maypoles with drunken and promiscuous behaviour, replaced by small poles imported from Germany with happy skipping children around them. The Lord and Lady of the May with their practical joking were replaced by a pretty May Queen. Certainly there was no place for the drunken noisy Jack in the Green. The custom was revived in Hastings by Mad Jacks Morris Dancers in 1983. We do not say we are following exactly what happened, this is a custom for now, not a fossil. Jack is returned, he is not the property of a small group of dancers, but belongs to us all. Long may he dance! Further information about the Jack in the Green in Hastings can be obtained by reading the excellent booklet "The Hastings Jack in the Green" written by Keith Leech. Keith, a long time member of Mad Jacks Morris was instrumental in reviving the tradition in Hastings and is a usually seen dressed as a "bogie" or green man, one of Jacks' attendants, during the procession on the May Bank Holiday.